You have two English Language exams so get clear about what each of these requires. Look for patterns so you can prepare more effectively for both. For both exams, you will need to be able to read critically. 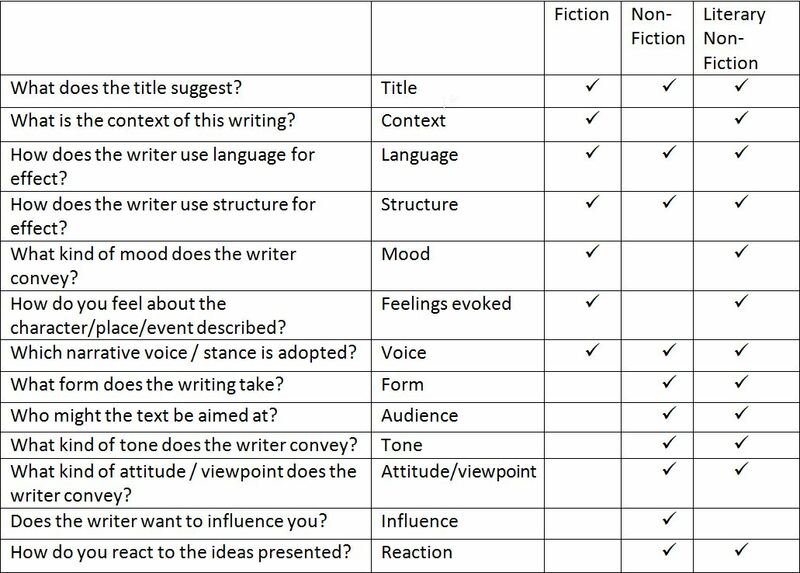 You will need to be able to analyse fiction and non-fiction texts. Don’t forget, there are many similarities. Some, such as pathetic fallacy, are more likely to crop up in fiction or literary non-fiction. ‘Use of structural devices’ requires you to look at how the writer builds the whole text. Remember to quote to support your answers where you have been advised to do this in the question! Gap analyse mock papers and practice tasks you have done, noting how to improve your answer, e.g. Use the toolkit offered here whenever you read an extract or text. Try it out on a breakfast cereal box one morning! Practise pieces of writing and show them to others who can comment on how effectively you are conveying ideas. There are a lot of websites offering all kinds of solutions to ‘revision’. Make sure that you don’t spend valuable time web-hopping – identify a few good ones (your teacher has probably already given you a list) and then stick to working on their suggestions rather than searching for a ‘holy grail’ which doesn’t exist. At the end of the day, you actually need to do some work!